Sapna Choudhary's debut Bollywood film Dosti Ke Side Effects 1st day box office collection. 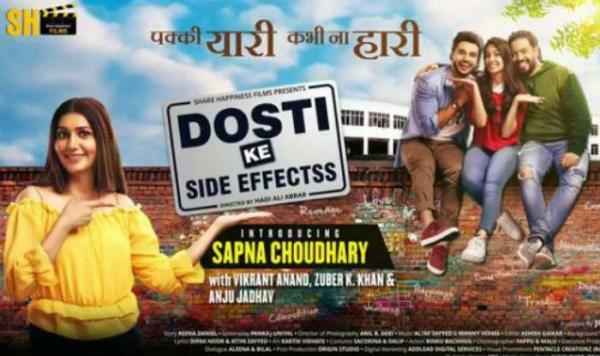 The Haryanvi dance sensation Sapna Choudhary’s Bollywood debut film Dosti Ke Side Effects has released this Friday, 8th February 2019. It’s also the valentine week on the roll with today being Propose Day. Directed by Hadi Ali Abrar and produced by Share Happiness Films, it revolves around the life of four friends. Due to Sapna’s massive fan following and popularity, the movie started garnering a lot of buzz and attention since its announcement. Dosti Ke Side Effectss is expected to do an opening collection of Rs 2 crore. The Sapna starrer has been released alongside The Fakir of Venice starring Farhan Akhtar and horror film Amavas starring Nargis Fakhri. All of these haven’t got much of a buzz and headed for a low opening day. These films will face a strong competition from previous releases like Kangana Ranaut’s Manikarnika: The Queen of Jhansi and Vicky Kaushal’s Uri: The Surgical Strike. Let’s see if her debut film would be able to win the audiences’ hearts like her dance numbers or not. The first film of Sapna Choudhary has got songs like Teri Akhya Ka Yo Kajal, Tu Cheej Lajwaab, Chetak, Daud Ki Chori, among others. She is one of the popular Indian celebrities. Before appearing in this film, she had been a part of the most controversial reality tv show of India – Bigg Boss (season 11). The film also stars Vikrant, Anand, Zuber K. Khan, Anju Jadhav, Neel Motwani, Sai Ballal, Vaishnavi Mahant, and Himmayat Ali. There is no doubt that the positive word of mouth can boost the sales of tickets at the counters.